SYDNEY, Australia. Feb 17. 2017. 9:45am AEDT. This long-awaited World Tour will climax with 18 special homecoming concerts through October and November, 2017. Given the band’s deep connections with central Australia the local leg will kick off in Alice Springs and Darwin before starting to circle their homeland with a show in the rainforest near Cairns. 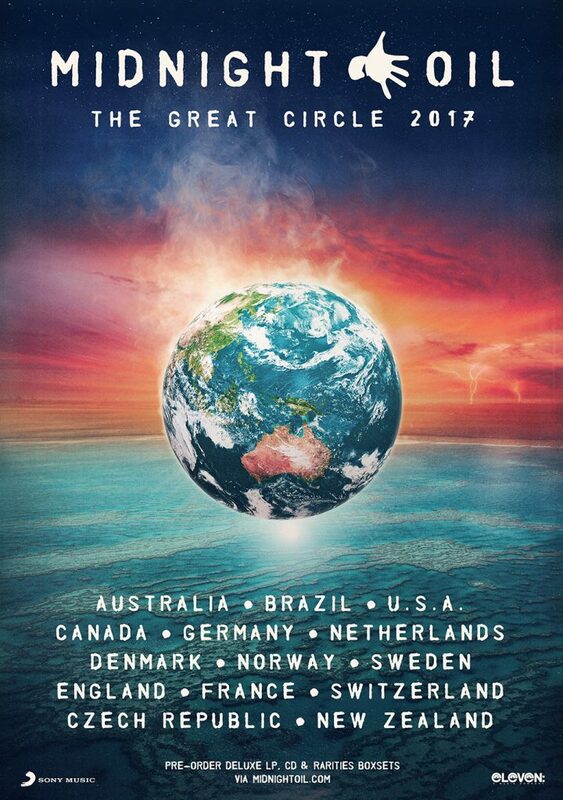 Over the following five weeks the tour will loop clockwise around the country in mainly outdoor venues including Hope Estate in the Hunter Valley, Victoria’s Hanging Rock and Melbourne’s Sidney Myer Music Bowl, Brisbane’s Riverstage and the Village Green beside Adelaide Oval before “The Great Circle” finally comes to a close right back where it all began; with a final show in Sydney on November 11 at that traditional home of Australian political activism, The Domain. People who sign up to Midnight Oil’s mailing list at www.midnightoil.com/mailing-list in the next few days will get first access to Australian tickets in a special pre-sale on Thursday February 23rd alongside Frontier Touring Members. Remaining tickets will go on sale to the general public on Monday February 27th.